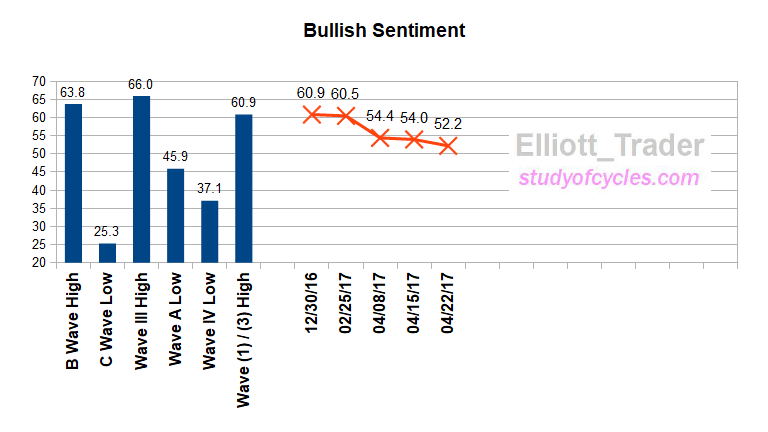 The percentage of bullish sentiment across multiple surveys of individuals, fund managers and letter writers normally moves at a snail's pace - sometimes changing only 0.5% or 1% at a time. This week, apparently on just the news of round one of the French elections, bullish sentiment has soared by more than five points. 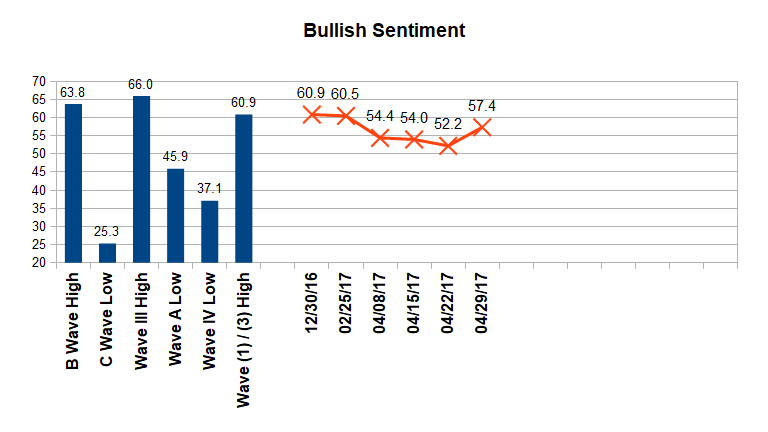 Weekly Bullish Sentiment Soars More Than 5 Points! A change like this is almost unprecedented in one week. (Note that the 5 point drop off in sentiment from 60.5 to 54.4 occurred over almost six weeks!). Someone is drinking the Cool-Aid again - within points of an all time high for the S&P 500. We hope it's not you. We also note some real anomalies like extremely low trading volume in a number of instruments - and just want to alert you to it. 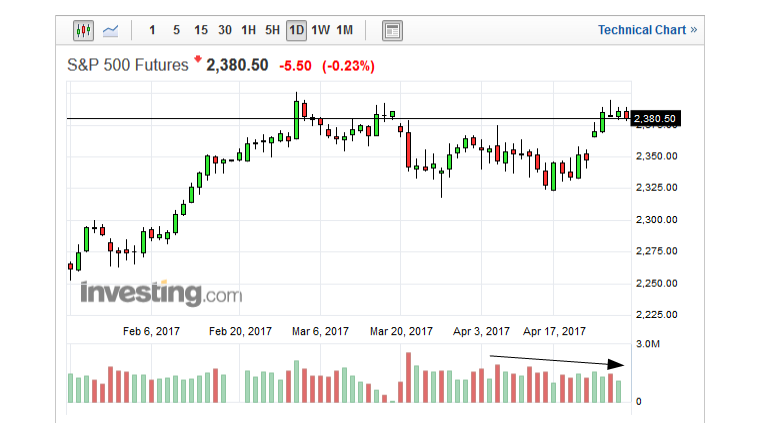 The chart below, of the ES E-Mini S&P 500 Futures shows this volume decline during April. And CNBC Reported Friday that SPY volume might come in at the lowest of the year! So, while there may be a few more up days in this current move, the lack of support by volume combined with the high bullish sentiment, above, may be indicating undue complacency. And, it is again interesting, that after it's new high, the Russell 2000 is again leading the way lower with a difficult day on Friday. Further telling is a decline in readership and comments across a number of market-related web sites. It seems people usually get interested after the big movements have started, and not before. Well, that's enough for this weekend. Enjoy the rest of it! With 127 candles on the chart, S&P500 30-min prices started attacking the lower channel line as indicated in The Eight Fold Path Method. This chart is shown below. This count does provide alternation for wave (ii) and wave (iv) in that wave (ii) is a running flat - where the x wave goes over the high by quite a bit. Within wave (iv), neither the ((B)) wave nor the x wave goes over the high. It is the lower ((B)) and x waves that provide that alternation. With Monday possibly seeing the "beginning of the month" inflows from mutual funds, 401k's, dividend reinvestment plans, company month-end bonuses, etc, it is possible that a (v) = (i) wave will carry over the top to end the minute ((b)) wave upward. See the two black measuring boxes which are the same height. The Elliott Wave Oscillator is in good position to indicate a fourth wave because it is within +10% to -40% of the high for wave (iii). And, it is clear we have indicated wave ((3)) of (iii) on the peak of the EWO, with ((5)) of (iii) on a divergence. Further, if you measure the wave in this manner, you will find wave (iii) equals almost precisely 2.618 times wave (i). 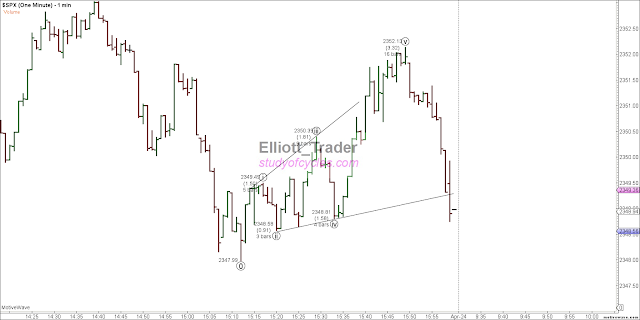 Today, we were expecting a 38% retrace of wave (iii), but, while close, that did not happen. It suggests there may be some strength on Monday. The primary word of caution would be that wave (iv) has not yet taken up as much time as wave (ii). Perhaps that is symptomatic of a minute ((b)) wave up, or it may indicate there is one more down leg to be provided by the overnight on Sunday. If the correction gets deeper, however, a (v) = (i) leg will likely not cross the high, and we might have to look to (v) = 0.618 x net distance traveled by waves (0 through (iii)), the common second target. It turns out the DOW can be counted in this same manner, but, interestingly, the DOW has not made the 90% upward mark that the other indexes have. A new high over wave (iii) would allow that. Again, the reason we can count this wave up as an impulse is the Dow made it's previous sub-waves (a) and (b) ALSO as a flat, so this is minuet (c), as an impulse, to end minute ((b)), as best I can tell. The S&P500 is in exactly the same count. Per our charts of Crude Oil in the last two days, Crude Oil did make five waves up from the low, with good alternation, and then began undergoing some corrective waves. Yesterday provided a lower low in the Dollar Index which has given it most of the required formation for a contracting diagonal lower. 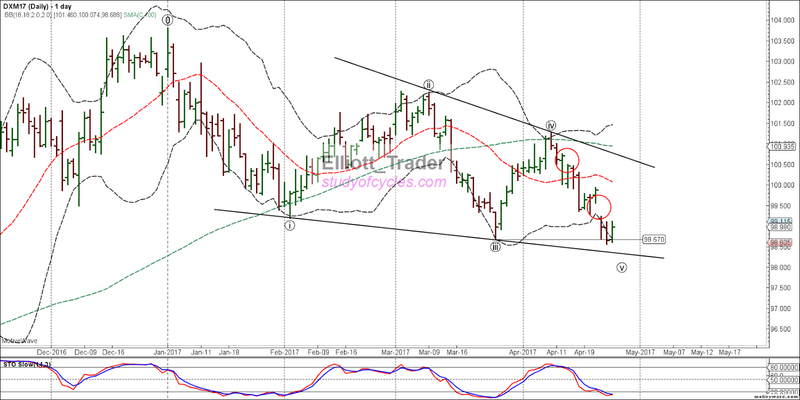 Here is the daily chart of the Dollar Index, showing that potential contracting diagonal. The lower low below minute ((iii)) now means that as a leading diagonal, the minute wave ((v)) lower has not failed. Remember, the fifth waves of Leading Diagonals may not fail, only the fifth waves of ending diagonals may fail. Note, too, the slow stochastic is in over-sold territory, price is against the lower daily Bollinger Band, and there are two clear unfilled gaps shown in red. Further movement down for the dollar is certainly possible, but to maintain a diagonal shape, then wave minute ((v)) must remain shorter than wave minute ((iii)). During the day I provided this updated count of the Russell 2000 which accounts for the new all time high. 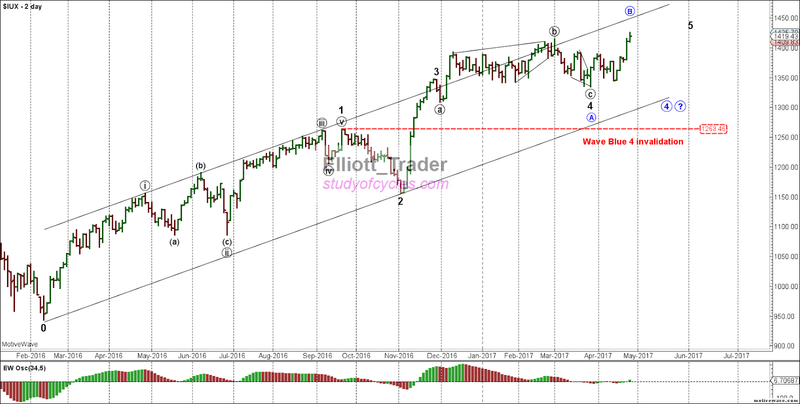 It considers that we may still be in the 4th wave (count in blue) because the lower channel has not been contacted yet. Many of you will recall I counted the Russell's move down in April as a contracting diagonal. That was a 'good call', as it was, in fact, a diagonal - an ending one. However, since the low of wave minute ((a)) was not exceeded lower that means the contracting shape at the top - which could have been counted as a diagonal - was not, in fact, an ending diagonal, but only a minute ((b)) wave. This is very often the case. And, yes, a flat or complex wave 4, would have good alternation with the sharp wave 2. But, because wave 3 would then be shorter than wave 1, then wave 5 would need to be shorter than the length of wave 3. In the daily S&P500 cash index, I can provide only this 'partial' count from the low of Minor wave 2. I have taken great pain to follow the guideline that when a second wave retraces less than 38.2%, then it likely means the first wave is the extended wave in the sequence. The resulting count is below. So, within Minor wave 3, the count is simplified and streamlined now, and follows more rules and guidelines although a good Elliott parallel is not formed for wave 3. None-the-less, the count breaks no rules, and a 38.2% wave could be allowed for the minor wave 4. As of today, the S&P500 did hit and surpass the 90% mark in the upward direction that was needed to claim the three wave ((b)) wave upward. Remember, the signature of the upward ((b)) wave can be very messy. It could be the simple (a), (b), (c) shown, but if a true impulse is not made for the (c) wave, then the minute ((b)) wave 'could' be counted as a (w)-(x)-(y), as well. So far, though the upward wave is still in an impulse channel upward, so the (a)-(b)-(c) for minute ((b)) is more appropriate. If and only if the upward wave does not finish properly will we give it the latter designation. And, recall that, yes, the ((b)) wave can go over the top, with no issue. Then, too - just like the Russell - a flat for Minor 4 will also alternate very well with the sharp wave we counted for Minor 2. You'll note that there are now about 112 candles on the chart, and wave ((3)) of iii is on the low of the Elliott Wave Oscillator, and the EWO returned to the zero line for wave iv. While only more more new low - beyond ((X)) - is needed to prove out this count, there would be nothing wrong, and it would be good form, if wave v became as long in price as wave i, was. Let's see how this works out. It sure has been odd to have Crude Oil and the Dollar declining at the same time. But, that is a perfect example of why I "consider every market in it's own count" and do not look to the correlations that periodically happen. Sometimes, those supposed relationships just vanish, too! Some websites want to send you back to the beginning of recorded stock price history in the U.S. to tell you why their Elliott Wave counts, which don't seem to work out when viewed under close scrutiny, must work out in the future. Just recently, one (ahem) shall we call it alternative Elliott Wave site, which claims it is objective, was projecting higher and higher third waves - which, as you know now - never developed. But, the odd thing is the authors of such sites rarely, if ever, say, "we got it dead wrong". How can a site be objective if it won't admit when it's tools and techniques just don't work? Wrong at the May 2015 high. Wrong at the 2016 bottom. 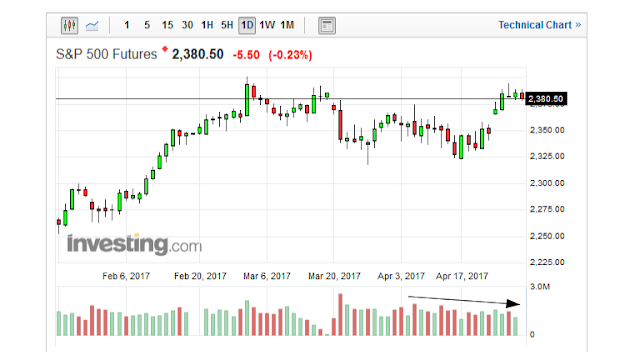 Wrong at the March 2017 high. I on-the-other-hand prefer to stick to real Elliott Wave analysis, as I understand it. And I think many, many people really don't understand it that well yet either. That's why I try to help show you how real wave analysis works - on any time frame from 5-minutes (as in yesterday's post) to weekly, monthly or more. 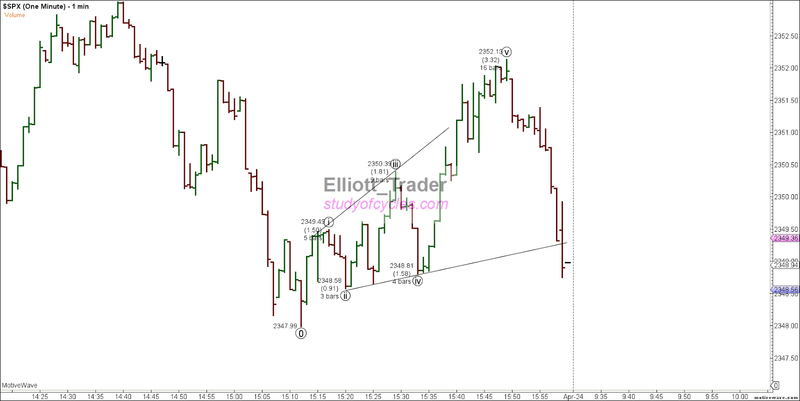 I prefer to live with some uncertainties of true Elliott Wave analysis because I know that's what mirrors life. There is almost always a choice. There is almost always an alternate. This week I will show you the two most likely Elliott Wave Counts on weekly charts, and tell you which I prefer and why. It is no change from the past several weeks. The first count above is of the potential Primary 5 impulse wave upward. As of this point in time there is nothing that breaks any true Elliott Wave Rule in this count. It would be made up of five Intermediate sized non-overlapping waves higher, and that would normally be fine. Just, if Intermediate (2) were a flat with the higher B wave, as shown, then one would expect Intermediate (4) to be a triangle or a more simple zigzag to provide alternation with the flat wave (2). That could still happen. But, there are five reasons why I don't like this count that go beyond 'simple' wave analysis, and proceed to more modern wave analysis as it has been further delineated by the likes of Glenn Neely, and Bill Williams. Part of Wave (3) breaks the Primary wave ((4)) to (2) trend line, indicating loss of momentum at that point. Wave 2, as you can see, drops below this lower channel line, and it is more extreme if the real zero-to-(2) trend line were drawn in. 'Usually', 'most-often' all of wave three is above the zero-to-two trend line except in diagonals. Wave (2) does not have a very deep pull-back - it is only 38.2% at maximum. 'Usually', 'most often' second waves are between 50 - 78% or more except when the first wave is the extended wave in the five-wave sequence. But, the supposed third wave is longer, ruling out wave (1) as the extended wave in the sequence. Wave (2) is not a sharp wave. 'Usually', 'most often' second waves within true impulses are sharp or zigzag waves, and this one is a flat. While not a deal-breaker, it is a cause for concern. Sentiment. As you know, we track sentiment weekly. And you can see from the chart below that while sentiment is falling off - as expected - from the high of March 1st, it is nowhere yet near the lows of prior waves. I would expect, before an upward turn, that sentiment will fall lower yet. Finally, the NYSE Advance-Decline line has recently made new all-time highs. 'Usually', 'most often' the $NYAD will diverge with price before the all time highs are made. That just hasn't happened yet. For the reasons above, and not because of any sacred mystical cycles or hidden proprietary analysis, the count below is currently the preferred one. As you can see, because there is no Intermediate third wave yet, this count eliminates all of the problems with a third wave breaking the zero-to-two trend line. In fact, in this count you can see from the channel that minute wave ((iii)) exactly lives up to that guideline. Yes, it is not a rule, but it is a guideline we would rather waves live up to than not. Also, there would be four more Intermediate sized waves in the near future to show divergence with that advance-decline line. So, that's the rationale. We can see both sides of this coin, but clear and unequivocal reasons are provided for preferring one over the other. The real item of interest is that in either the Intermediate Wave (4) wave in the Alternate, or the Intermediate wave (2) in the Preferred count, it is very likely that that down wave could have the form of a zigzag! And that is the amazing part. And that is why the ES 8-hour count published previously may be taking the form of the downward expanding diagonal that we have been showing for weeks now - because in a true zigzag, a real minor A wave is needed - made up somehow of five minute-sized waves. But, the most important thing is that it is regular Elliott Wave analysis. There is nothing mystical about it. There is nothing mysterious about it. There is nothing here that doesn't already appear in two or three books, and a couple of videos all of which are available for only modest cost or no cost. 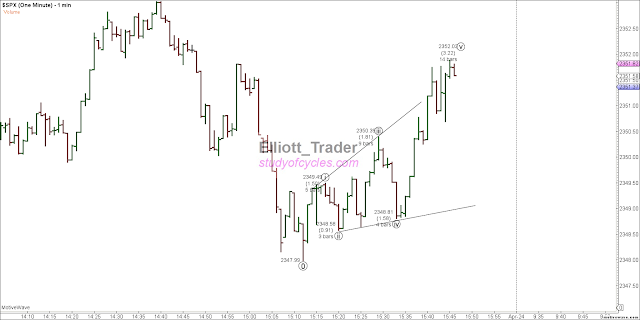 Are you learning your Elliott Wave? We hope so. Can we be wrong? You bet. But when we are, you hear it here first - along with why! SUPPLEMENTAL: At the request of a comment that asks good questions, I am posting these two one minute charts from the live chat room that were done in real time. The first chart shows the detail that is possible today with good measuring tools and speedy equipment. At the time of posting this in the live chat room, I intentionally left all of the wave marker data on the chart, so a person could see that the measurements are exact for an expanding diagonal. Wave ((v)) is longer than wave ((iii)), which is longer than wave ((i)), and wave ((iv)) is longer than wave ((ii)), overlaps wave ((i)) but does not travel beyond the low of wave ((ii)). They are all three wave internal sequences that look like zigzags to me because they don't have "pull backs" in them. Well, there it is! 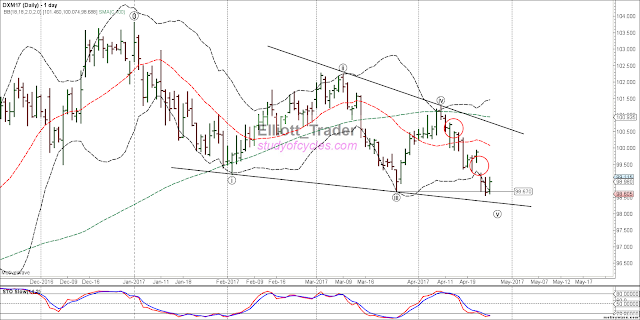 Another Elliott Wave prediction come true. So, please be careful about criticizing building up larger fractals from smaller fractals because they are definitely there! But, stop being amazed there, and think. Look at the very top of the wave in the first chart. You notice that I did not call ((v)) done by placing it on a wave bar? That was because I couldn't find an ending formation yet. And when you look at the second chart, what do you notice? C'mon now. There is a perfect little ending contracting diagonal for the (c) wave of ((v)). I just didn't draw in the trend lines. Can you?